Life Lesson: Just when you think you are at the top of the mountain, there is still more to climb! I have noticed this phenomenon for many years of hiking, but it really struck home during my hike in England. 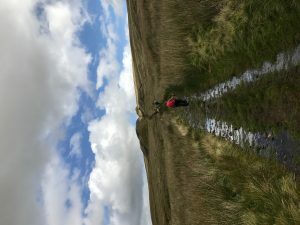 As we crossed Blea Moor, There came a steady climb up to the top of the moors. From the base of the hill, I stood looking up and saw, at the top, one of the vent shafts for the train tunnel far below my feet. I put my head down and started walking. I walked with determination to get to the top. It took time, it took energy – but the end was in sight. When I finally got to the top, and stood beside that vent shaft, I looked forward along the trail and realized….. I am not at the top. There was another incline ahead of me – and another vet shaft at the top. So, I refocused and kept climbing. More time, more energy. My muscles burning slightly, my breath slightly shortened. But, I made it to the top – just to see another incline! This time, it really was the last one. Getting to the top was quite an accomplishment. I thought back to some of the other hills I have climbed – most notably the Devil’s Staircase in Scotland four years ago. I realized how better fit I am, and how much easier it is to climb these hills. I thought back to the mountains in the Shenandoah’s that I visit each summer. One thing that almost all of them have in common is that when you climb to the top you can see – there is still higher to climb. I realized that life is much like this as well. In so many ways, we strive to get to the top of the mountain that we can see – a better house, a better job, promotions, raises, accomplishments, etc. But every time we get there, we realize that there is something more to strive for. This can be good or bad. If we are always reaching for the next “best” thing, we can forget to stop and see what is around us. Just as I put my head down and focused on getting to the top of the mountain, I forgot to pause along the way to see the scenery around me. There was life all around the moor – flowers, sheep, grass, birds. I had tuned them all out to focus on the path and the walk. However, if we ignore the climb to the top of the mountain before us, content to walk around the mountain, or worse yet, to remain at the bottom, we miss so much! From the bottom of that hill, I couldn’t see the distant scenery, I couldn’t see the mists and rainbows in the distance. Standing at the bottom, I could only see what was immediately around me. This gives us nothing to look forward to – no challenges, just complacency. Perhaps that is why there are tops to reach – times to pause and look around – to look back at where we have come from, and to look forward to the next climb.